As you may recall, a couple of weeks ago my cousin Jody made a big discovery: handwritten notes that her mother had made of Joseph Brotman’s children. It included all the children we already knew about: Bessie’s children Hyman, Tillie, Gussie, Frieda (Florence in her notes) and Sam, as well as the two sons we knew of from Joseph’s first marriage, Abraham and Max. 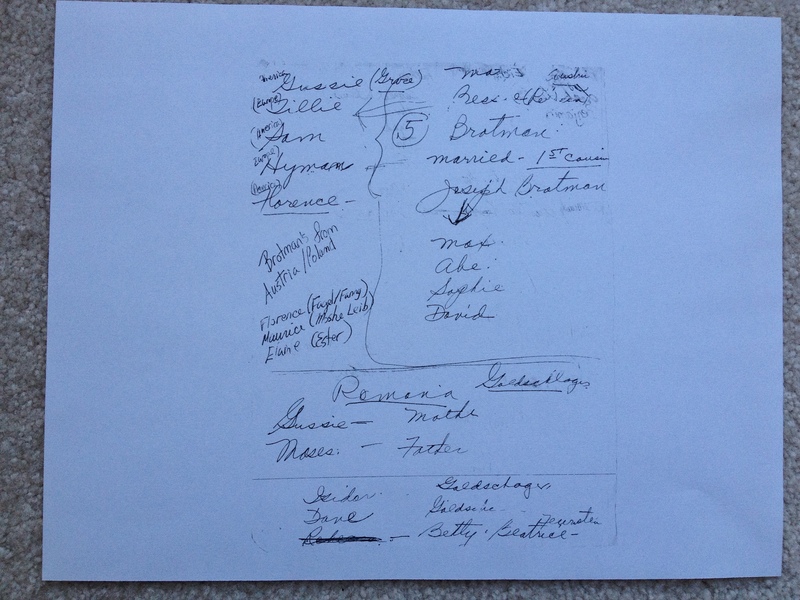 My brother had recalled that our aunt had said Joseph had had four children from his first marriage, but we did not know the names of the two remaining children, and I had traced every possible Brotman I could find to see if there was a link. I had hit many dead ends and found nothing that linked these other Brotmans to our family. My aunt’s notes were a huge discovery because for the first time we had evidence of the names of those two missing children: David and Sophie. As I wrote when Jody first sent me the tree, I was able to locate a David Brotman from Austria who was a possible match for Joseph’s missing son, but I needed to check further and obtain some documentation in order to be sure. 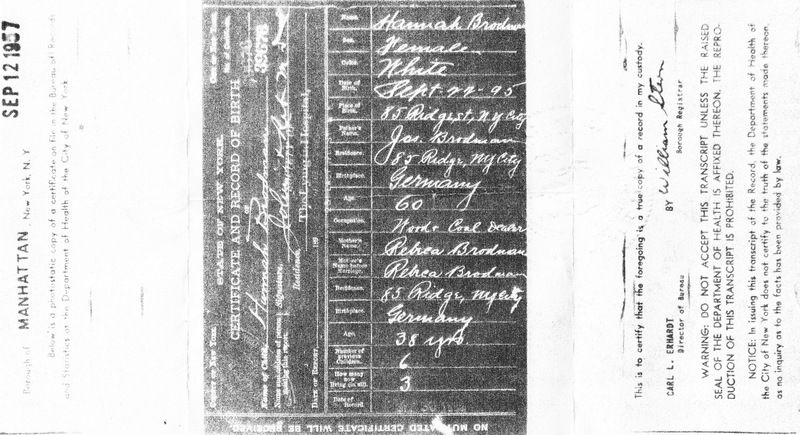 Well, those documents arrived the other day, and I was so excited to see that on David’s marriage certificate in 1897, he listed his father’s name as Joseph Brotman and his mother’s as Chaye Fortgang. You may recall that Max had also listed his mother’s name as Chaye on his marriage certificate, so this confirmed that Joseph’s first wife was named Chaye, but now we know her surname as well. 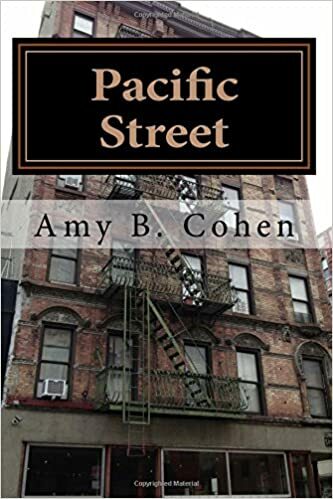 In addition, the marriage certificate gave David’s current address as 85 Ridge Street—the same address where Joseph and Bessie were living in 1895 when Gussie was born, according to her birth certificate. This confirmed for me that David was Joseph’s son, Max and Abraham’s full brother, half-brother to Hyman, Tillie, Gussie, Frieda and Sam, and our great-uncle. I am still in a state of amazement that I was able to find him. Thank you, Aunt Elaine, for leaving behind this great clue to our family. Once I had this information confirming the relationship, I located whatever census reports and other records I could find for David and his wife, Annie Salpeter. 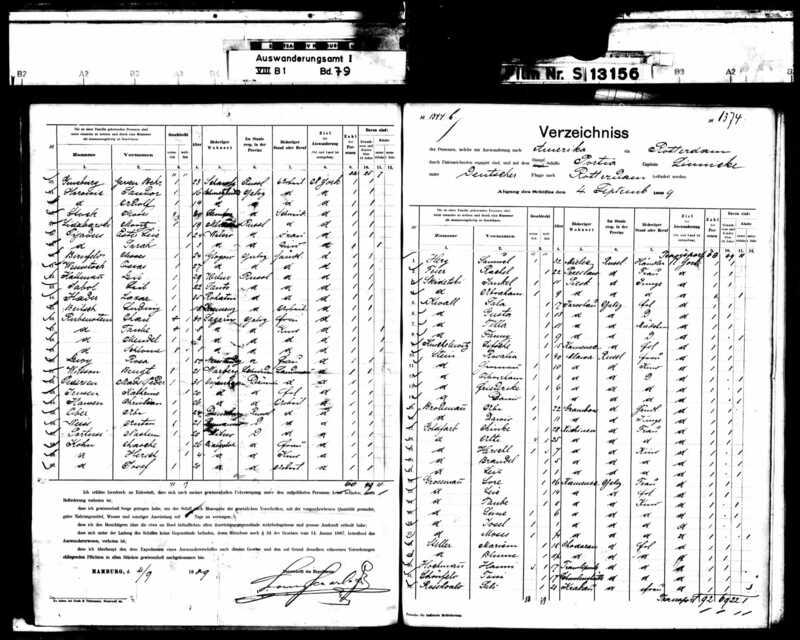 I found them on census reports for 1900, 1905, 1910, and 1920. David was a tailor according to the first three census reports, and he and Annie were living on the Lower East Side until at least 1910. 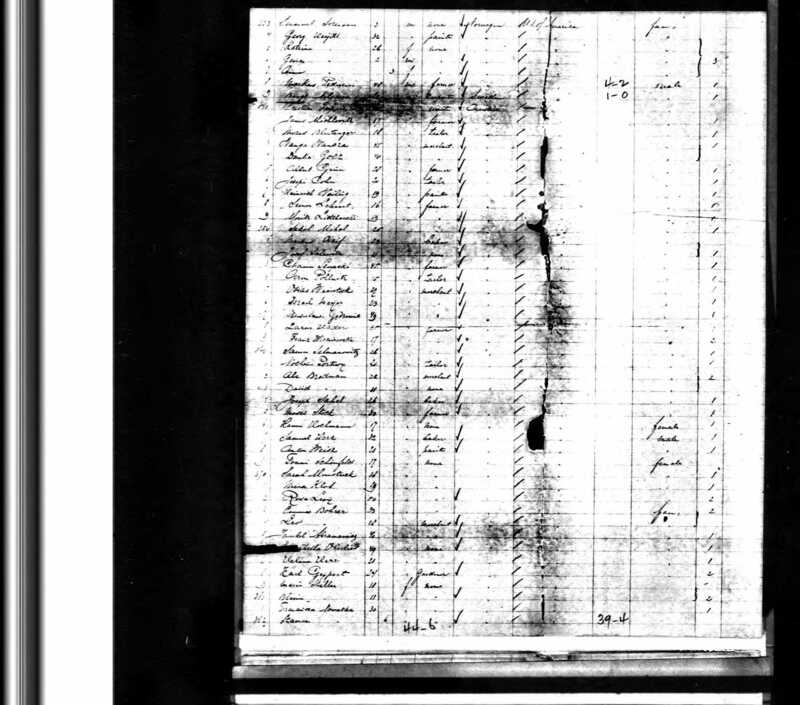 At times Annie’s brother Morris lived with them as well as a cousin Meier, but there were no children listed on any of these census reports. I’ve yet to find David and Annie on the 1930 or 1940 censuses, but I am still looking. It seems unlikely that they had left Brooklyn. 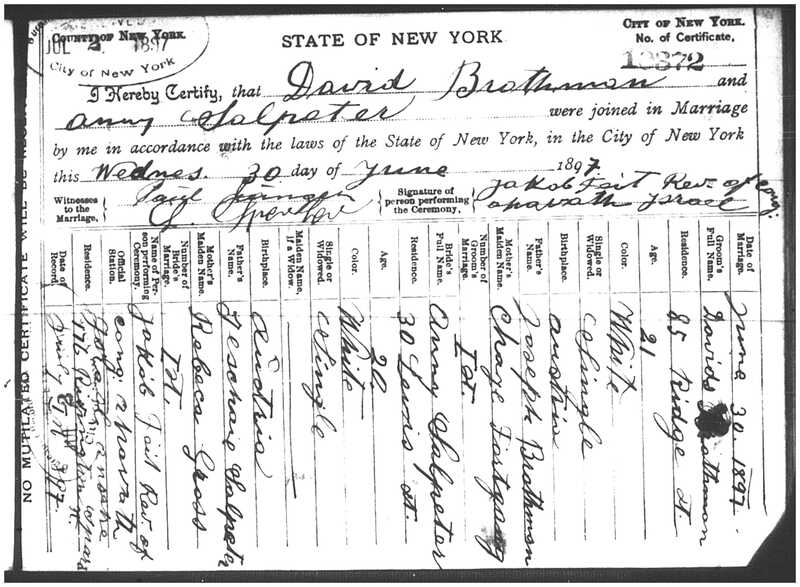 I was able to locate a 1946 death certificate for a David Brotman married to Anna living at 10 Sumner Avenue in Brooklyn, and I believe this is the same David, despite the fact that the death certificate has his father’s name as Isaac. I’ve learned enough to know that death certificates are notoriously unreliable. I will continue to see if I can find anything about David and Annie after 1920. 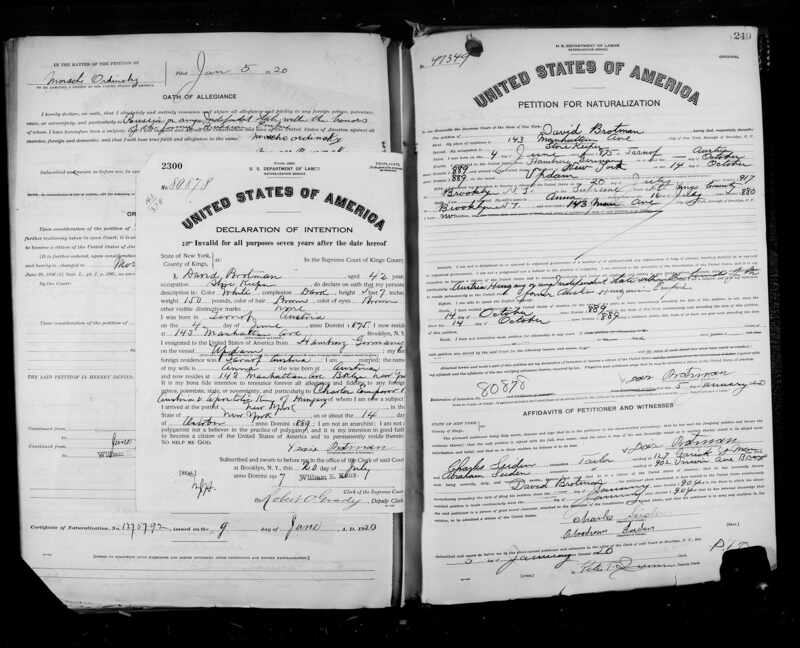 I do have David’s petition for naturalization in 1920, and it indicates that he had arrived in NYC on October 14, 1889, on the “Updam” from Tarnof, Austria. Tarnof could be Tarnow, a city about fifty miles north of Tarnobrzeg/Dzikow and even further from Czchow, the two areas that I have been focusing on as the Brotman hometown based on Hyman’s listing of “Jeekief” and “Giga” on his documents. But Tarnof could also be Tarnobrzeg, the larger town that is near Dzikow. So did this new information help our search for our hometown in Galicia or did it just make it more confusing? That led me to search for the ship manifest for David, now that I knew when he arrived and on what ship. With some help from Renee, I located a September 4, 1889, German ship manifest for the Portia, sailing to Rotterdam, listing Dawid Brodmann as a passenger. I was excited to see that David was traveling with his older brother, Abe Brodmann. I had not previously been able to find Abraham on a ship manifest, so this was another exciting discovery. On the Portia ship manifest, Abe and David are listed as coming from “Grambow, Russland,” not Austria at all, let alone Tarnow, Tarnobrzeg, Dzikow or Czchow. I would have found this an indication that these were not the right boys, but there is a town right near Tarnobrzeg called Grebow, and according to a 1914 map, Tarnobrzeg was very close to the Russian border. So perhaps our family lived in Grebow? Or maybe that is where Joseph lived with Chaye and then moved to Dzikow when he married Bessie? On the manifest for the Obdam, sailing from Rotterdam to New York arriving on September 19, 1889, David and Abe are listed as coming from Austria, not Russia, which appears to be correct. There is obviously some confusion and conflict here, but it’s another clue and another place to look for the Brotman home in Galicia. I already have contacted several people researching this area to see if I can uncover more clues. I have a few more leads to follow to fill in the gaps in David’s life story, and maybe they will even lead me to Sophie, the only remaining child of Joseph to locate. There is also some potential evidence that will link our family to the Brotmanville Brotmans, but again, I need to do more research before it is worth speculating about that connection. 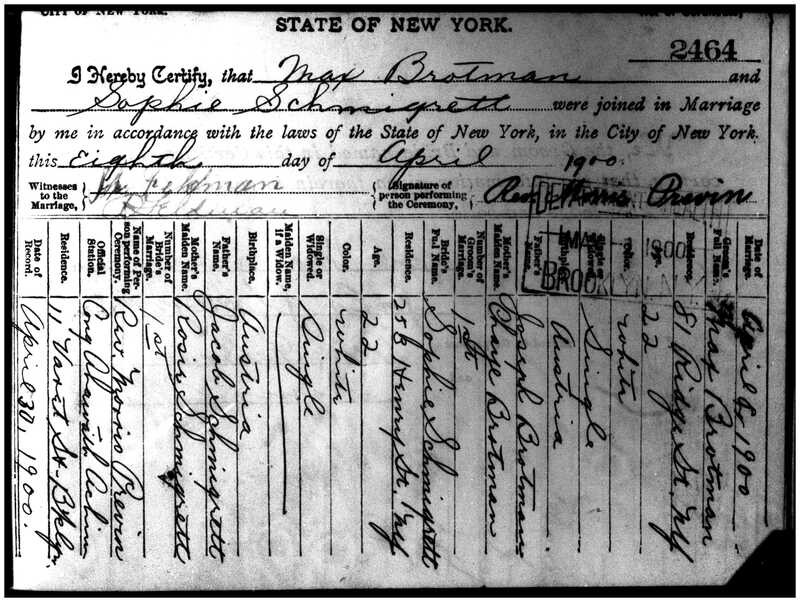 This entry was posted in Brotmans, Galicia/Poland, Genealogy, Lower East Side, Miscellaneous information and updates and tagged Abraham Brotman, Austria, Bessie, Brooklyn, David Brotman, Death certificate, Family, Galicia, genealogy, Joseph Brotman, Lower East Side, Manhattan Avenue, marriage certificate, Max BrOtman, Tarnobrzeg, vital records by Amy. Bookmark the permalink. Thanks! This was so exciting for me! Did you ever hear your grandfather mention a brother David? He must have been living with them both in Galicia and in NYC. I will have to ask my mother if she ever heard her mother mention a David. It sure was news to me!